Do you use it for marketing? 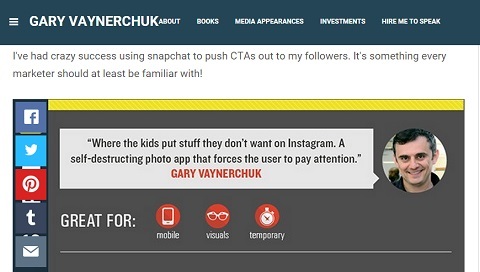 To learn how to use Snapchat for your business, this is an interview with Gary Vaynerchuk, the CEO of VaynerMedia, and Shaun McBride, also known as Shonduras, a celebrity on Snapchat. Gary and Shaun will share what marketers need to know about Snapchat. According to Shaun, a lot of people think that since Snapchat content disappears, it’s not valuable. He says that’s not the case. On many social media platforms, viewers scroll through content quickly. And even though those posts will be there forever, viewers will never see it again. Marketers are only grasping for 50% of users’ attention at a time, and those users never look back. Snapchat users can’t look back. However, marketers have 100% of their audience’s attention for the length of the content’s life. Shaun explains that on Snapchat, you send out pictures or videos for a certain number of seconds (1 to 10). As the consumer, you absorb that content and then it disappears off your screen. You never see it again, unless you screenshot the frame of a movie or a picture, which gets reposted. Shaun uses Snapchat to involve and engage his fans in projects. For example, Shaun created a Jurasnap Park, playing off of Jurassic Park, full of all of his friends. He invited them to take a selfie, draw themselves into a dinosaur and send it to him. He then took screenshots and reposted all the dinosaur snaps of his fans for the world to see. They felt involved because it was a group project, rather than a project he just did on his own. With Jurasnap Park, Shaun (a.k.a. 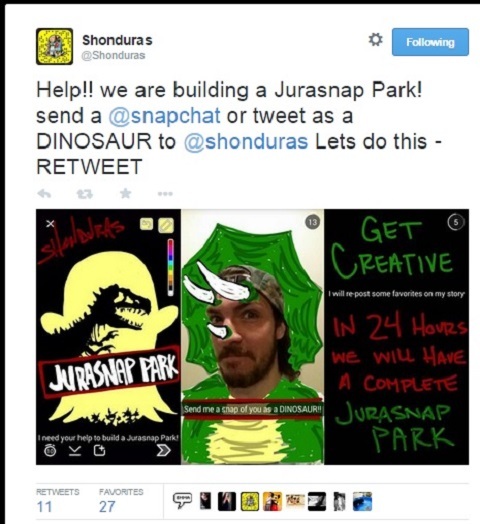 Shonduras) involved his friends and fans on Snapchat. Gary explains that what Shaun did with his Snapchat story is a way your business can interact with everyone who follows you, instead of just engaging one to one. Creative people think of stories in a linear sense, Gary shares. They put out 7 to 15 collections of images to tell a 150-second story instead of just one 10-second story. Depending on how you want to tell a story, Snapchat offers options. You can share a long narrative, like snapping your entire night at the Super Bowl or just add one snap at a time. Snapchat has enormous creative potential if you understand context. Shaun snapped his way through Disney World. Shaun created a platform for himself, Gary adds. Many people engage with Shaun because he gives back. Some enjoy getting acknowledgement from somebody they deem famous. Others are building their own profiles and engaging with Shaun because they hope he creates awareness for them. Snapchat is great for behind-the-scenes fun, Shaun says. For a Disney campaign, the brand sent him out to Disneyland and Disney World. As he explored the parks with his friends, he interacted on Snapchat by asking people where to go next, posting their responses and going to those places. This inspired others to go on their own adventures as well. Shaun explains that on Snapchat you can only see how many people view your stories and within that, how many people took a screenshot of your story. Although not traditional deep, it’s still information you can use. For example, if Shaun made a story about going to the store to pick up cereal, he would post a snap about going there and then a snap to show he got there. He’d snap another image, asking what cereal to get and then take and post pictures of three boxes of cereal, asking fans to screenshot the cereal he should get. He’d finish up with a Snapchat of him checking out. With the feedback on these six to seven different Snapchats, Shaun can learn to make better stories in the future. He would see how many people viewed it, and check the fall-out ratio from first to last Snapchat. He would also look at which snaps got the most screenshots, as well as which was more popular: video or an image. Gary refers to Shaun as a practitioner, not a consultant. Shaun uses the platform on a regular basis, so he doesn’t need reporting or big data to guide him. He’s creating and adjusting on the fly, just like many early adopters of other platforms have done in the past. Shaun suggests users new to the platform begin by watching their favorite personalities. 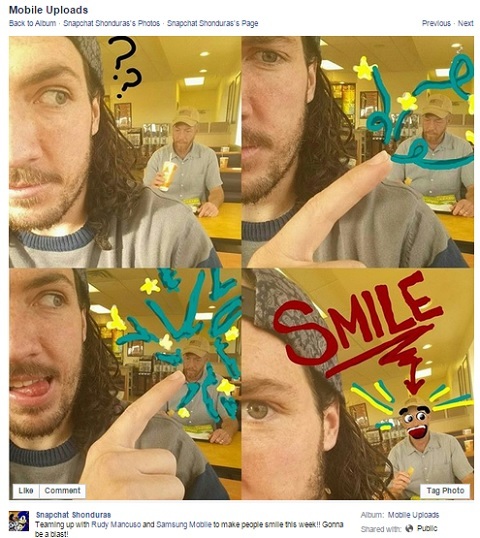 Pick out similar brands or follow Shonduras on Snapchat. Then see how they engage with their audience. Put it into perspective for your own demographic and goals. Then just go for it! On Snapchat, you can draw on top of the images or video you post. You communicate and create art. Gary believes Snapchat is the closest thing to how we actually communicate in the world. After a phone call or a one-on-one conversation, all the content disappears. Shaun feels Snapchat is keeping the platform personable, real and stress-free. There’s no ability to “like,” no way to know how many friends or followers you have and no way to compare how many people you are following versus how many are following you. All that stress is taken out, so people can enjoy the app. Snapchat is adding new features that make the platform more fun, but there are no metrics at this point. One of the new features, Gary explains, is a section called Discover, which is literally media consumption. This is a very important platform, he adds. He stresses that you should figure out how to tell stories on Snapchat now before it gets overcrowded, so you don’t miss out. ​What do you think? What are your thoughts on Snapchat? Please leave your comments below. If you need any assistant, please feel free to contact us.